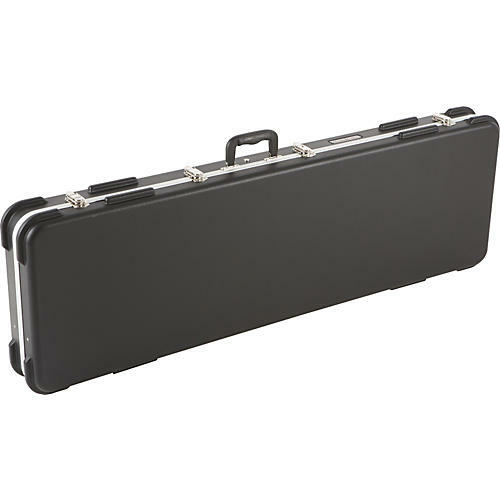 This Road Runner molded bass case is designed to fit a variety of electric bass guitars of various shapes. It has a non-scratch, thicker pile, plush-lined interior and padded neck brace with 2 accessory compartments-one covered and one open. For extra protection, the molded exterior is extremely roadworthy. The hardshell bass case also has a tongue-and-groove valance, rubber feet, 3 riveted latches-the middle one has a lock & key mechanism-and an offset handle for easier transportation. The soft, plush interior protects your bass from scratches and nicks, plus Road Runner uses a special, eco-friendly, dye-free material, which eliminates the release of polluting bi-products into the environment.